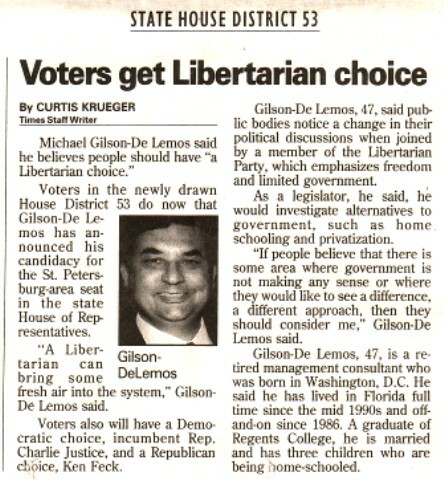 Michael Gilson-De Lemos said he believes people should have "a Libertarian choice." Voters in the newly drawn House District 53 do now that Gilson-De Lemos has announced his candidacy for the St. Petersburg-area seat in the state House of Representatives. "A Libertarian can bring some fresh air into the system," Gilson-De Lemos said. Voters also will have a Democratic choice, incumbent Rep. Charlie Justice, and a Republican choice, Ken Feck. Gilson-De Lemos, 47, said public bodies notice a change in their political discussions when joined by a member of the Libertarian Party, which emphasizes freedom and limited government. As a legislator, he said, he would investigate alternatives to government, such as home schooling and privatization. "If people believe that there is some area where government is not making any sense or where they would like to see a difference, a different approach, then they should consider me," Gilson-De Lemos said. Gilson-De Lemos, 47, is a retired management consultant who was born in Washington, D.C. He said he has lived in Florida full time since the mid 1990s and off-and-on since 1986. A graduate of Regents College, he is married and has three children who are being home-schooled.